Former CIA employee who leaked US government secrets warns Israelis over state surveillance, criticizes private Israeli cyber firms. US whistleblower Edward Snowden urged Israelis to be on guard against heavy-handed government and private surveillance in a speech by video link Tuesday and defended his 2013 massive leak of classified documents. Snowden highlighted Israel's high-tech capabilities, but warned that accepting too much government surveillance and too easily acceding to the argument that it is needed for security reasons posed serious risks. "If we can allow ourselves to be terrorized by someone with nothing but a knife, to reorder our societies for the convenience of state power ... we've stopped being citizens and we've started being subjects," said Snowden, who spoke from an undisclosed location in Moscow. The 35-year-old also spoke of the NSO Group, the Israel-based company known for its Pegasus spyware. The software has been pinpointed by independent experts as likely being used in a number of countries with poor human rights records. 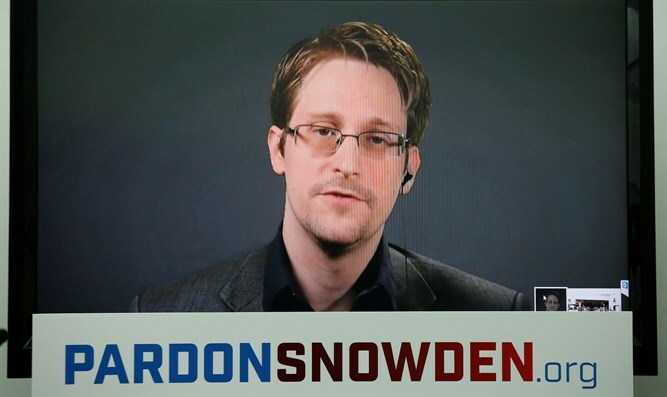 "The idea is that companies like this increasingly are popping up all around the world," Snowden said. In one case, international experts investigating the disappearance of 43 students in Mexico in 2014 were targeted with the spyware after it had been sold to the government, the experts said. NSO Group says its product is intended to be used only for investigating and preventing crime and terrorism. It says it investigates allegations of improper use. Snowden, a former contractor with the US National Security Agency, leaked thousands of classified documents to the press in 2013 which revealed the vast scope of surveillance of private data put in place after the 9/11 attacks. He has lived in exile ever since. The United States has charged him with espionage and theft of state secrets, but Snowden said he still loves his country and hopes to return home. But he said risks had to be taken since "this world will only ever be as good as we make it." Snowden spoke to an invited audience in Tel Aviv at an event organised by Israeli public relations agency OH! Orenstein Hoshen.